Planning a seminar for your SME organization, or a business to business networking event? One of the first things you’ll want to nail down is the venue. So how do you go about choosing the best venue for your event? There are several options: hiring a professional event planner, contracting a venue procurement agency, or doing it yourself. This guide to vetting the venue that is right for your event or seminar goes over all three options so you can make an informed decision. As entrepreneurs and SME business owners, especially those of us who dwell mostly in the digital world, we’re a frazzled lot with all the emails, messages, notifications, alerts, feeds and information coming at us nearly 24/7. If only we would turn to our personal assistants – meaning the intelligent assistant (IA) software we have on our phones (laptops, and smart speakers). Smartphone penetration in the US and UK is approaching 70%, yet we’ve been slow to take advantage of the software at our fingertips that is designed (and can) save us time and increase our productivity. Today, we largely limit our IA use for a narrow range of tasks, such as planning the day or finding information, but they’re now capable of doing so much more. This article explores the vast app ecosystem (6.2 million apps!) and how to fully leverage IA software potential. A speaker series featuring successful entrepreneurs sharing their business failures, with the provocative name F–kup Nights (they don’t use dashes), has become a global phenomenon. 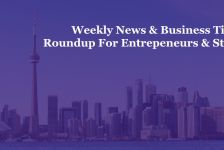 The founder and director of F–kup Nights Toronto, Marsha Druker, is quoted as saying: “We’re so obsessed with success we only want to talk about the companies and the people that are doing really well – the unicorns of the world. But there is so much more we can learn from failure.” Designed to create a safe space for people to learn from failure, the talks are formatted like TED talks, with each speaker getting seven to 10 minutes and 10 images with which to share their failure story and the lessons they learned. Presently there are seven other Canadian cities besides Toronto where F–kup Nights groups have been created: Kitchener-Waterloo, Ottawa, Montreal, Edmonton, Kelowna, and Vancouver. How Engaged Are You in Digital? A recent Google-commissioned study by Deloitte to explore the levels of digital engagement among small businesses (250 or fewer employees) yielded some interesting findings. Titled Connecting Small Businesses in the US, the study determined that there were four general levels of digital engagement with corresponding outcomes in opportunity, market share and revenue. The four levels were defined as basic (no website or social media presence), intermediate (simple website and basic digital marketing), high (advanced, mobile-ready website and social channels), and advanced (used of data analytics and mobile apps). The leadership specialist and author of this post states that he has determined that “leadership in its purest and most unadulterated form comes down to one overarching theme: serving the needs of people so they can reach their fullest potential.” However, not everyone is meant to lead. Here he describes seven toxic management behaviors that can alienate employees and tear down businesses, from displaying narcissistic tendencies to micromanaging personnel. According to an Intermedia report, the average small-to-midsize business uses 14.3 separate applications, with software systems for logistics, sales, marketing, accounting, HR, and more. The problem is that unless integrated, each application is an information silo that limits business owners’ ability to access data and get a clear, holistic picture of their operations. Enter application integration, which allows you to derive the maximum impact from each system by linking them into an interactive whole. The author describes four specific benefits from integrating your applications – greater productivity, access to real-time data, increased efficiencies, and improved customer experience – as well as the two basic options for doing so. Your brand is about user experience: being consistent with your branding strategy yields a consistent experience for your target audience/clients/customers that sets expectations and addresses pain points, and ultimately builds brand loyalty. It further plays a major role in how your startup will be perceived in the marketplace, from launch to venture capital investment. While logo design is a fundamental first step in branding your startup, you should first have a branding strategy in place that clearly addresses the who, what, when and how of your brand’s message. Here the author provides a descriptive guide on how to define a competitively distinct branding strategy for your startup, as well as tips for designing a logo that builds brand equity and resonates with your prospective customers. While a budget gives your business guidance and focus, it needs to be flexible to account for disruptions (such as tariffs). In such instances, you’ll need to revise it, which begs the question: how do you balance an ever-changing budget? Here, the author gives nine tips as a starting point to ensure you always have insight into your company’s operational needs, from zeroing in on sales forecasts to planning for one-off expenses that could otherwise hurt you. Entrepreneurs don’t have to achieve the level of Amazon’s Alexa to drive business results with chatbots, but they do have to implement them the right way to prevent the bots from doing more harm than good. When implemented correctly, chatbots are fast, accurate, and increasing able to anticipate users’ needs, and with the advent of machine learning, their messages can become more personalized over time. Here are three key steps to successfully launch a chatbot: define a purpose and choose a chatbot that both suits your business model and serves its intended function; don’t dupe customers into thinking your chatbot is a person; and give your bot a performance review.